A tri-lifter is a type of heavy machinery that can be used to move equipment in confined spaces. Tri-lifters can comfortably carry over 100-ton loads depending on the build of the machine and is useful for maneuvering in indoor spaces, such as in a garage or a workshop, or in outdoor situations that require low-clearance equipment including freeway underpasses. The tri-lifter allows for ease of lifting and a variety of makes and models are suited for a range of jobs. With options made for all kinds of projects, such as 360 rotation and forklift adjustments, a tri-lifter can help with any job. 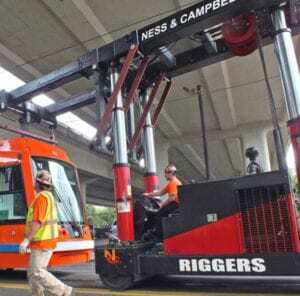 If you are looking for crane service in Portland Oregon, using a tri-lifter can help make sure project gets off the ground smoothly. If you are looking for the perfect lifting equipment for your small project or looking to increase the effectiveness of your inventory organization, a tri-lifter may be the right lifting equipment for you. A tri-lifter is a piece of heavy machinery that allows the driver to lift smoothly with limited overhead clearing space. This capacity is key in small, enclosed areas that can be difficult to navigate in, as an overhead lift presents its own set of challenges in these tight situations. Oftentimes, as is the case with the forklift tri-lifter, working inventory becomes easier because the tri-lifter design increases stability and allows for heavy loads to be raised safely above the driver’s head. The addition of a remote-controlled option for the lift for easy lowering and raising from another vantage point allows for more precise controls and the ability to avoid a range of obstacles, particularly in manufacturing plants or distribution centers. The versatility of the tri-lifter, from the weight capabilities from 50-110 tons to various attachments, makes it the perfect piece of machinery for any lifting job, in tight quarters or not. Available at a reasonable price for any work site or manufacturing plant, a tri-lifter gives you the power of a larger crane in a size built for smaller spaces. If you are looking to invest in a tri-lifter for your business today, contact NessCampbell. We can answer questions you may have about the effectiveness or load capacities of a tri-lifter, and any other heavy machinery inquiries. Give your project a leg up on the competition today by investing in a tri-lifter for those hard-to-access spaces during your next big project.